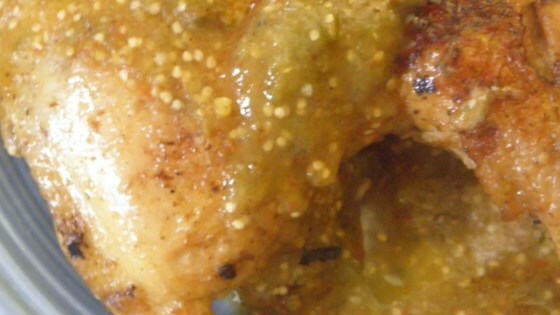 "Chicken pieces are seared and then simmered in a tomatillo sauce. This is my mother in law's recipe from the state of Zacatecas, Mexico. Serve with warm tortillas and your choice of rice or beans as side. We recommend a cold cola pop to accompany your delicious meal." Preheat the oven to 350 degrees F (200 degrees C). Place the tomatillos, California chilies, and red chile peppers into a small roasting pan or a rimmed baking sheet. Roast for about 20 minutes, turning frequently. If the chilies start to get too dark, remove them and place into a food processor or blender. Heat the oil in a large skillet over medium-high heat. Add chicken pieces and cook, turning to sear evenly on all sides. Combine the tomatillos and chilies in a blender or food processor and blend until smooth. Season with salt to taste. Pour this mixture in with the chicken. Reduce the heat to medium-low, cover and simmer until chicken is tender, 20 to 25 minutes. The dish is a nice idea but the tomatillos have a very sourish flavor once roasted. You will need to cut the flavor with a small amount of suger. I made the recipe as written. I loved it. I have a garden full of tomatillo's that are about to be made like this and froze. Made it with modifications...some garlic and salt, fresh chillies, and onion....tastes wonderful!